"Enthusiasm is intense enjoyment, interest, or approval; great eagerness to be involved in a particular activity which you like and enjoy or which you think is important"
Although I'm certain that this isn't how movements start, I want to start a movement. I want to encourage people to rebel against this obnoxious outdated notion that caring is tragic, and instead to revel in the fact that something somewhere makes their heart sing and makes them wanna get up in a morning. I want us to reclaim our enthusiasm, and be unabashedly proud of loving something with all of our heart or all of our head - or both! Being enthusiastic about something, whatever it is, is pretty sweet. It doesn't have to be something big or grandiose, and you don't have to worry about it being impressive to your friends - it's whatever it is that you're really, really passionate about. * For some, it's huge earrings. For others, it's world peace. For some, it's really, really good donuts. For a lot, it's all three. 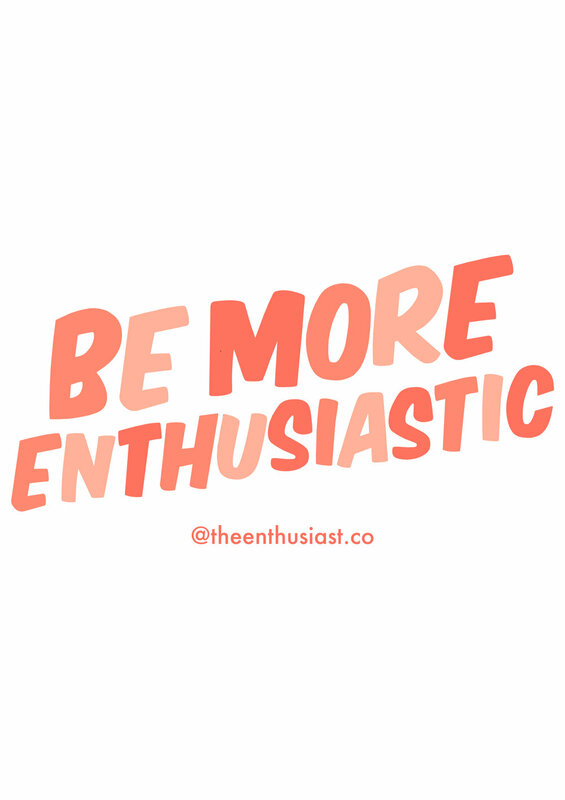 It doesn’t even have to be one specific thing - you can be enthusiastic without having a specific Enthusiasm. *unless it's anything racist, sexist, homophobic, or downright dickish - in which case you can just walk right on by. Buh-bye. And without going too deep, your hero, in business, lfe or otherwise, is probably extremely enthusiastic about something - that's why you idolise them. If you think back to autobiographies and articles you read up on them, I bet one of the things you appreciated most about them was their resilience and their refusal to give up because they were so bloody enthusiastic about what they do. So why do people still think enthusiasm is a bit corny? Now more than ever, it's time to show off your passion, your joie de vivre, your unbreakable connection with something; and maybe even encourage others to do the same. Starting with t-shirts, and moving to talks, blogs, resources and tips, we’re going to release your inner enthusiast. Ground control to Major Tom, commencing countdown; engines ON.